MAPLEWOOD, NJ - Maplewood joined communities nationwide that have made life a little easier for its Orthodox Jewish community. 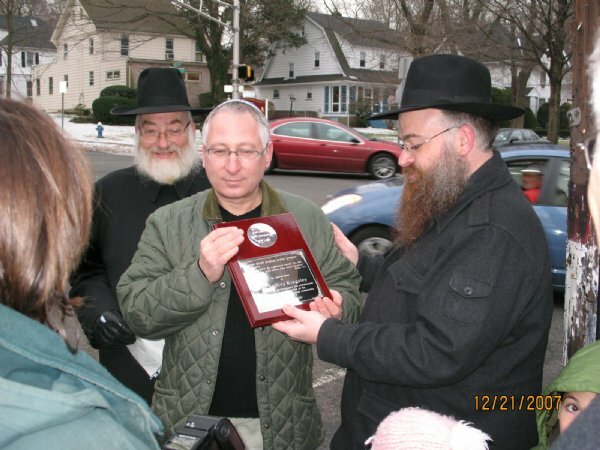 On Dec. 21, members of both local Orthodox synagogues helped unveil the first “eruv” in Maplewood. An eruv, found in Jewish law, is a virtual boundary that allows Orthodox Jews to “carry” on the Sabbath. It is most often created using existing utility poles and wires. Mayor Fred R. Profeta Jr. joined in a ceremony at the foot of a utility pole at the intersection of Prospect Street and Parker Avenue, just across the street from Congregation Beth Ephraim-Maplewood Jewish Center. Aside from Beth Ephraim, Maplewood is home to one other Orthodox synagogue: Congregation Ahavath Zion, located on Boyden Avenue. For local Orthodox Jews, the eruv will make their lives easier.